Captain Kirk and Dr. McCoy are putting the finishing touches on their dress uniforms as the U.S.S. Enterprise arrives at Vulcan to pick up a delegation of ambassadors. These delegates from across the Federation are headed for a neutral planet code-named “Babel.” The planet Coridan, a small, poorly defended world rich in dilithium, has petitioned the Federation for admission, and a conference is being held to discuss their application. 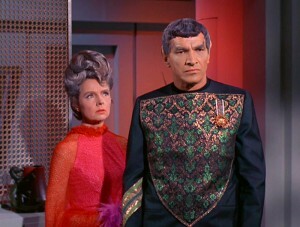 Tensions are already startlingly high when the Vulcan party comes aboard, lead by Ambassador Sarek, the Vulcan ambassador to Earth, joined by his human wife Amanda. Spock, in a charming moment, tries to teach Dr. McCoy how to do the proper salute but McCoy’s attempts are utter failures. Sarek greets Captain Kirk and Dr. McCoy warmly (for a Vulcan…), but turns a cold shoulder to Spock. The captain is a little perplexed but shrugs it off and offers to have Mr. Spock take him for a tour of the ship. The ambassador immediately declines the offer. Awkwardly, Kirk invites Mr. Spock to visit his parents while they are in orbit around Vulcan. SPOCK: Captain, Ambassador Sarek and his wife are my parents. Ouch, awkward! Too bad Kirk didn’t actually read Mr. Spock’s personnel file.